The first Democractic Presidential Debate was dominated by domestic policy issues, but there were still plenty of opportunities for the candidates to say things that were devoid of specifics or even just flat-out wrong on defense. Foxtrot Alpha will dissect these statements just as we’ve done for the two Republican Presidential Debates. The candidates’ opening statements were a sign of what was to come when it came to addressing America’s military issues and our engagements abroad. 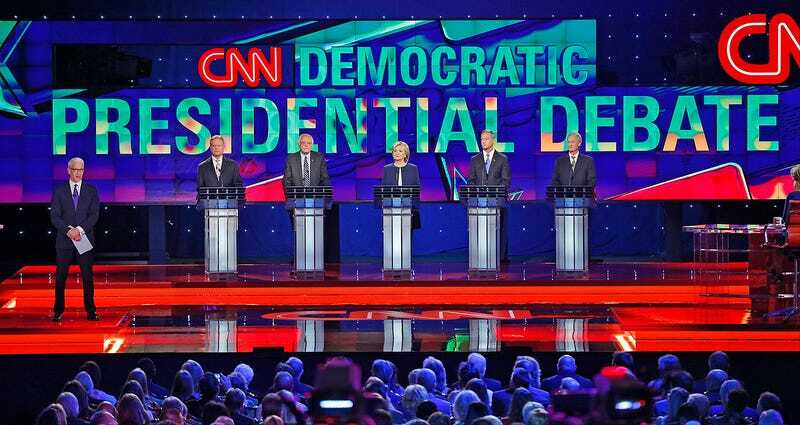 The majority of the Democratic candidates didn’t even mention foreign policy at all in their statements, and those who did merely brought it up in passing. This is a stark contrast to the last Republican debate, where Iran, Russia and China were major topics from the get-go. We’ll start with former Secretary of State Hillary Clinton, still the party’s front-runner and most probable nominee. Although Russia was more flexible and far less belligerent when Medvedev was president, Putin remained in the Prime Minister role, and it is largely understood that Medvedev was not his own man. In other words, it is questionable if the policies enacted when Medvedev was president were not sanctioned by Putin directly. So although Putin’s relationship with the West has been fractured in his third term as president, it is not like this happened because Medvedev stepped aside to take on the Prime Minister seat that Putin vacated. The two leaders can be seen as almost a single entity, even after the invasion of Crimea. When it comes to Syria, the Obama Administration has briefly talked with Russia in a high-level military-t0-military manner shortly before bombing operations began. Both sides have floated the idea that talks should commence in order to work together, at least when it comes to deconflicting airspace for military aircraft operations over Syria. Yet even with this initial overture of goodwill, Russia seems to be uninterested in any such cooperation and has not followed through with these talks, and although now this may finally be changing, but there are no guarantees. Currently, Russia dominates Syrian airspace where they are striking targets at will, the majority of which are not ISIS related. They shadow U.S. drones and even making incursions into Turkish airspace. As such, there is little incentive for them to give up any of this operational freedom to facilitate U.S. interests at this time beyond putting forward some basic rules, so that U.S. and Russian aircraft do not collide or shoot each other down due to a misunderstanding. So when Clinton says “it’s important too that the United States make it very clear to Putin that it’s not acceptable for him to be in Syria creating more chaos, bombing people on behalf of Assad, and we can’t do that if we don’t take more of a leadership position, which is what I’m advocating”, it kind of means nothing. The Obama Administration has already made it very clear they are not happy with the situation and Putin could care less. Secretary Clinton has not yet made clear exactly how she plans on showing “additional leadership” to somehow change Russia’s goals in Syria. “Well, let’s understand that when we talk about Syria, you’re talking about a quagmire in a quagmire. You’re talking about groups of people trying to overthrow Assad, other groups of people fighting ISIS. You’re talking about people who are fighting ISIS using their guns to overthrow Assad, and vice versa. The Obama Administration has already put together a large coalition including many Arab countries to fight ISIS, although there seems to be varying degrees of willingness among them to deepen their involvement. This is especially true when it comes to Syria. The truth is Sunni Arab states’ interest in the the anti-ISIS fight has waned over the last year as little progress appears to have been made, and something nearing a stalemate appears to be approaching. Additionally, putting large amounts of hours on precision fighter aircraft and dropping guided bombs that cost $20,000 apiece at a minimum can quickly make a country rethink its involvement in such an operation if it appears to be treading water. Saudi Arabia, Qatar and a couple other Arab states have supported Anti-Assad fighters with weaponry via the CIA’s help, but even this is becoming more of a questionable activity, as it’s increasingly challenging to exactly identify the moderate forces fighting Assad. Since the anti-ISIS coalition air war kicked off heavily over a year ago, Sunni Arab states have formed their own coalition to actively deal with fighting Iranian-backed Houthi rebels in Yemen. These same countries also see Iran as an increasingly powerful player in the region, and are arming to defend themselves against potential Iranian aggression with very expensive weaponry. Their priorities are in other places than Iraq or Syria and the reality of fighting two wars on two fronts (ISIS and Houthi rebels), plus preparing for a possible third regional conflict with Iran, makes the possibility that Arab states will willingly deepen their involvement in the ISIS fight something of a pipe dream. Unless some very big sticks or carrots are presented to these Sunni Arab allies, nothing will change, and doing that will also invite risk. Jordan, which wants to fight ISIS in Syria to the best of their abilities and is currently doing so, could be further bolstered with advanced weaponry and additional support, but that small country alone cannot come close to dealing with an enemy as prolific as ISIS with just the U.S. in a support role. With this all factored in, it would be interesting to see how Senator Sanders plans to make Arab countries stand up and take the lead on the fight against ISIS in Iraq, and especially in Syria. This was one of the most puzzling moments of the night. A no-fly zone over Syria was an option to stop Assad from barrel bombing his own people and fighting back rebel forces with air power before the Russians showed up militarily. Declaring a no-fly zone over Syria now would be akin to the blockade of Cuba in 1962. This tactic could start a war that might escalate to terrifying levels very quickly and would mean that Russia would largely have to capitulate their interests in Syria in order obey it. As far as we know, Russia’s primary goal in Syria is to prop up the Assad regime, so trying to get them to fly coordinates strikes against ISIS alone alongside a flimsy coalition would be of no interest to Moscow. It is also another reminder of how many politicians, President Obama included, do not understand the limits and even the consequences of the use of air power. “Let’s start with why Russia is in Syria right now. There are three strategic failings that have allowed this to occur. The first was the invasion of Iraq, which destabilized ethnic elements in Iraq and empowered Iran. The second was the Arab Spring, which created huge vacuums in Libya and in Syria that allowed terrorist movements to move in there. And the third was the recent deal allowing Iran to move forward and eventually acquire a nuclear weapon, which sent bad signals, bad body language into the region about whether we are acquiescing in Iran becoming a stronger piece of the formula in that part of the world. There is no evidence that Russia’s military involvement in Syria was caused partially by the Iranian nuclear deal. Even the claim that Russia’s involvement in Syria is partially the result of an empowered Iran due to America’s involvement in Iraq is highly debatable. Syria and Iran have long had incredibly tight ties, and Russia and Syria have as well. Iran and Russia have kept strong relations even as Iran was put under harsh sanctions which were tacitly approved by Russia. Webb’s calling out China is not unwarranted, but once again, what does he plan on doing different than what the Obama Administration is currently doing? Just saying China is doing things he does not like and then saying he will do something about it is not a plan for dealing with the problem. Will he tariff Chinese goods? Will he sanction China economically? Will he install a sea base in the South China Sea? Just the tiniest amount of detail is all that would be needed to lend any weight to Webb’s statements. Without that, they are totally hollow. Putin has shown zero signs of regret for invading and seizing Crimea. He has regained a strategic position in the region and the home of Russia’s Black Sea Fleet. If anything, this is an act he has been most proud of, and his constituency agrees. As for what he is doing in eastern Ukraine, he doesn’t even have to own that war. He has destabilized Ukraine with very little effort and without having to deploy regular forces to do so. This has left him with a hole slew of options and he is largely in the drivers seat as to how that conflict proceeds. As far as Syria goes, although this operation could over time end up blowing in Putin’s face, at this time it is doing anything but. Assad-alligned forces, with the help of Russian air power and Hezbollah fighters, are gaining back ground lost to rebel fighters over the last year. Russia is showcasing its military capabilities to the world and to potential arms buyers, and for a fairly small investment, Russia will secure a puppet regime in Syria, air bases in the Middle East and along the Eastern Mediterranean, and they will keep the their only Mediterranean naval port in Tartus. Still, there is a chance that Russia could become bogged down in a never-ending war in Syria and possibly in Iraq if they enter that front against ISIS on behalf of the Shiite Iraqis and the Iranians. Even the possibility that rebel forces in Syria become armed with shoulder fired surface-to-air missiles could mean body bags being flown home to Russia on a regular basis. With dark memories of the 1980s’ Afghanistan War still fresh in many Russians minds, such an escapade could bleed Russia dry over time. But this is all conjecture. As of now, Putin seems to be a man with few regrets and seems to have a plan that gives him the most potential for reward at the lowest possible risk while also embarrassing the U.S. in the process. But I think it’s important, since I understand Senator Webb’s very strong feelings about this, to explain where we were then and to point out that I think President Obama made the right decision at the time. Libya is an absolute mess. The elections may have been held, but the country is now ruled by various factions, its capital is a battleground, and it is rife with extremist elements including those directly affiliated with ISIS. Libya’s refugee crisis has also become one of epic proportions. The fact that Clinton acts as if America and our allies work there resulted in anything nearing a positive outcome is completely absurd. As for her comments that orbit around the death of Ambassador Stevens in Benghazi, just saying that there are risks involved with diplomatic missions does not do the complexity of that situation any justice and it is, well frankly, alarming. Although the partisan witch hunt aimed towards Hillary Clinton as if she somehow caused this terrible incident may be ridiculous, critical and unique failings that led up to the attack on the consulate in Benghazi and the CIA operations center after need to be acknowledged, learned from and fixed. Treating this tragedy as if if it is just a risk of the job is an oversimplification of the situation. After all these years, and all the controversy, it was surprising that Secretary Clinton did not have better formed, more insightful thoughts to share about this tragedy and her perspective on it. Well, I was chairman for two years, and when I was chairman we did take action. What we did is pass a $15 billion dollar piece of legislation which brought in many, many new doctors, and nurses into the V.A. so that veterans in this country could get the health care when they needed it, and not be on long waiting lines. This may be true, but this only happened as a reactionary measure long after it was abundantly clear the VA was failing Veterans at an alarming rate and that corruption was rife within the institution. As a result, some have questioned the effectiveness of Congressional oversight of the VA, of which Senator Sanders was a key player. He broke the laws of the United States. He could have been a whistleblower. He could have gotten all of the protections of being a whistleblower. He could have raised all the issues that he has raised. And I think there would have been a positive response to that. In addition — in addition, he stole very important information that has unfortunately fallen into a lot of the wrong hands. So I don’t think he should be brought home without facing the music. Regardless of what one thinks about Edward Snowden, Clinton’s statement about his options is not accurate. It is unlikely that Snowden, a contractor, would have been protected as a whistle blower and the fact that he broke the law, stealing classified information that he was not cleared to access as a contractor, further complicates the matter. Even if he were to have gone to someone up the chain of command or even in Congress to make his case, the information would have likely remained classified. Stake holders in these programs and those in power who allowed them to proceed would have had no incentive to review their legality or stop them from continuing, let alone disclosing them to the public.